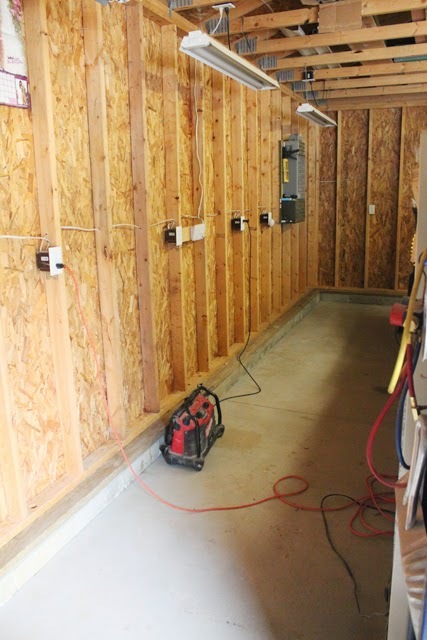 On Monday I shared our weekend recap and one important task that was completed was moving the entire garage contents into the center for remediation. 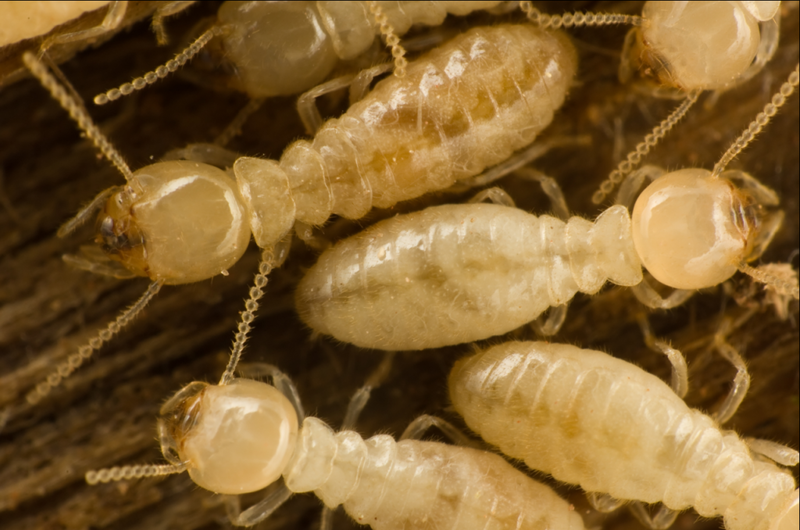 Remediation of termites. Mike found some evidence in the garage, (a couple mud tubes nothing more), a year ago and has been monitoring it. This year they were back and a little more damage than he was comfortable with. Nothing structural, just some wet cardboard that was demolished. 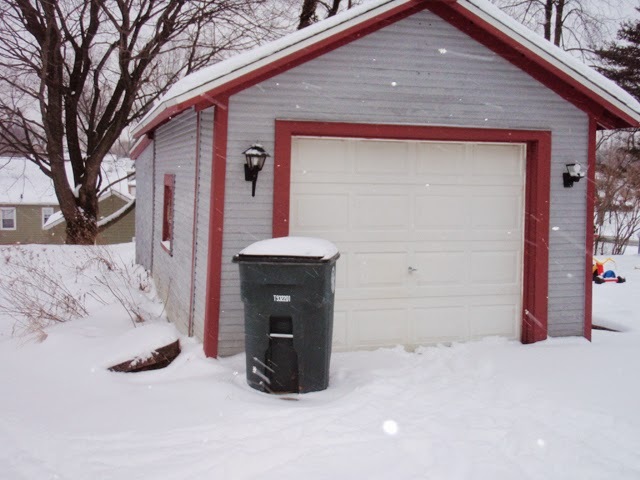 When we purchased our home 4 years ago we had a termite inspection and there was significant damage to the old garage. Which wasn't surprising since the entire back "addition" was untreated wood placed directly into the ground. 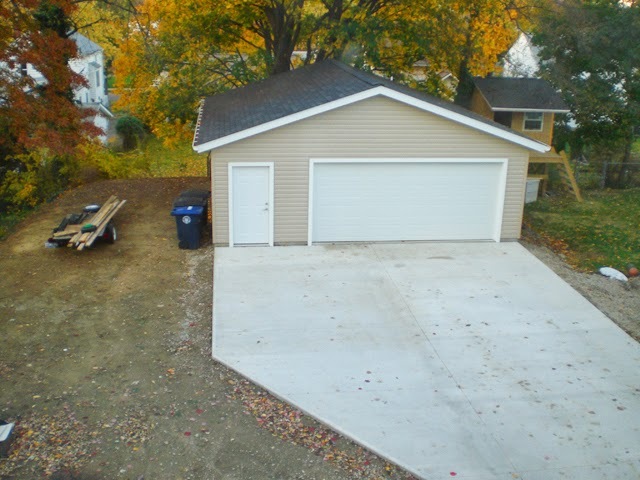 You can see why we called this a shed instead of a feasible garage option. We always had plans to demolish it since we would need something substantially bigger, so we took the remediation money, ($300-$400), from the seller and tore it down. We thought with all the work we did, demo, regrading the site, building in a different area, we were fine, but our area is a very established neighborhood and perfect place for termites, so they're back. We've had no structural damage, but it's best to get rid of them now before they have the chance. Like I said, Mike only found some mud tubes along the block, and they had gotten to some cardboard. 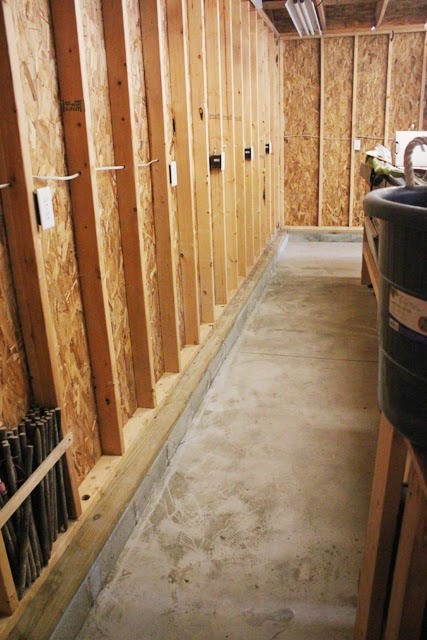 We have a sufficient foundation, and treated wood on top of that, so our suspicions were confirmed by the numerous companies we had come out to inspect for quotes that they were coming through the expansion joint between the block and sill plate. To me it seemed crazy that our garage is threaten by these tiny bugs, but it wasn't so crazy when I saw what they had done to some of the wood scrap we had stored behind the garage. This is a form Mike built for the bed of his truck which he uses during the winter to place buckets of sand it for the extra weight. It's not a big deal but seeing the little paths and actually seeing the bugs themselves in those deeper holes made it real for me. Not only that, but we moved the old hive from behind the garage and there was definite "structural" damage. Since we've gotten a new hive, (details for another post), we're not concerned. Also, it wouldn't be that hard to cut the damaged parts off, if we were to use it again. 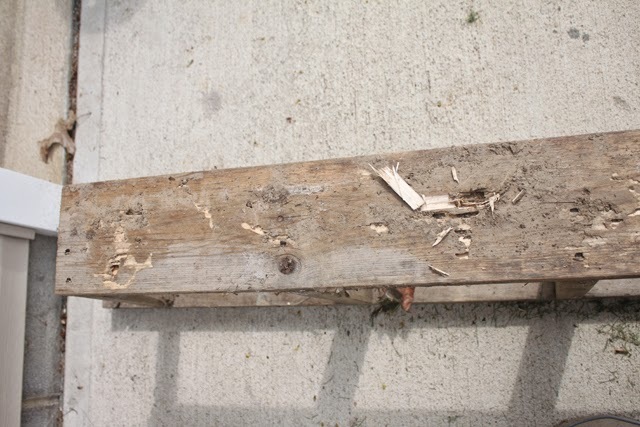 We didn't use treated lumber because we didn't want any part of the hive to have chemical soaked wood, so we would have to come up with a different solution if we were to use this again. This morning the exterminator that we chose actually begun the treatment, which is a liquid termiticide application. 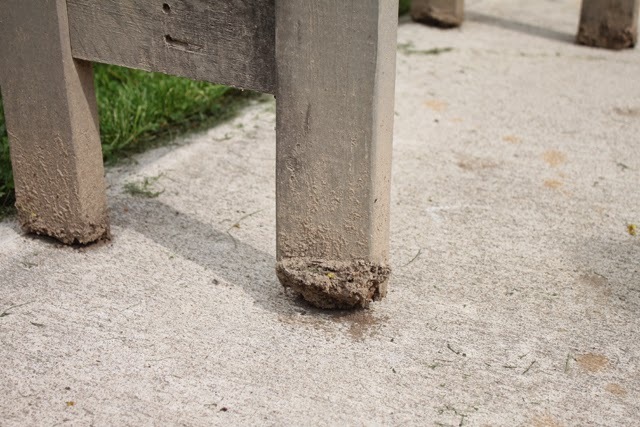 They will trench around the perimeter and drill into the foundation then treat with a termiticide. We chose this option because it was one the least expensive options at $350, but also because it will get rid of the termites that are already in the garage. The other option, baiting, could take months, and was much more expensive at $800. The hardest part of this option was the prep work, because access is needed around all the perimeter walls. Mike woke up early Sunday morning and was crazy enough to complete this entire task by himself! Seriously, I have no idea how he moved everything by himself. 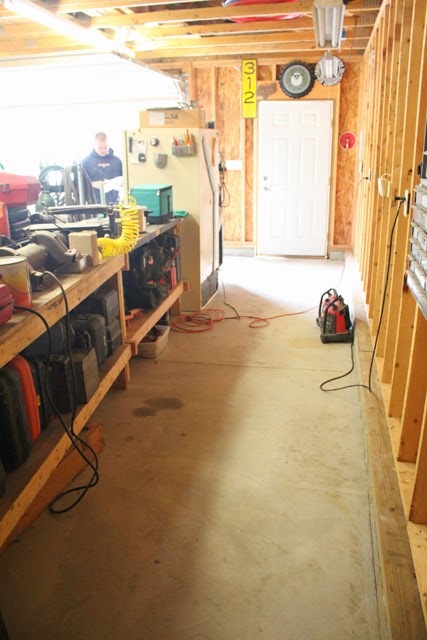 There's large tables along all the walls and tool benches and even a refrigerator! 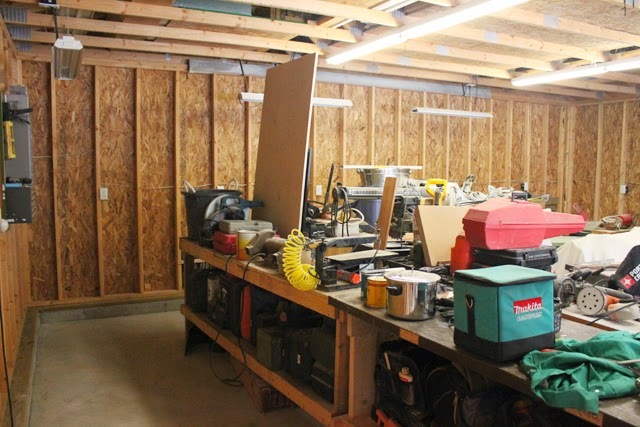 It's crazy to see the walls again since the moment this garage was built, it's been filled with Mike's tools. It actually might be a good thing, because it's given us some ideas of how to better utilize the space for storage and work space. Behind the garage also got cleaned up. Not only did we get about $100 from the scrap metal we turned in that had been storing back there, we cleared out the area for the trenching. Our first outdoor project was going to be addressing this area, so it's lucky we didn't do anything back here only to tear it up getting rid of the termites. 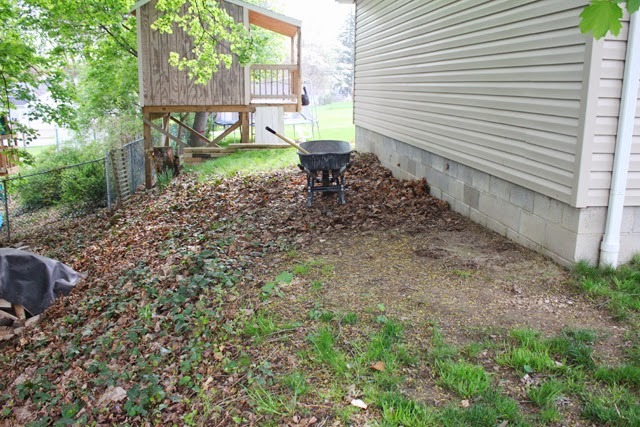 As hard as we tried, we can't get any grass to grow back here due to the large maple tree that over hangs from our neighbors yard. From the other side you can see that the back slopes down and everything on the slope is covered in ivy. Our property actually ends in the middle of the slope, before the big tree. Our neighbor installed the fence lower because it was easier. 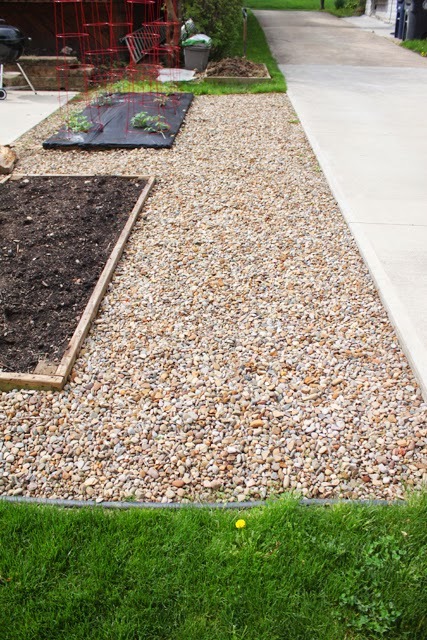 We still plan to put our bee hive back here but we're finally giving up on the grass and planing to fill it with rocks. We also want to have a definite edge where the ivy begins so it doesn't look so overgrown. 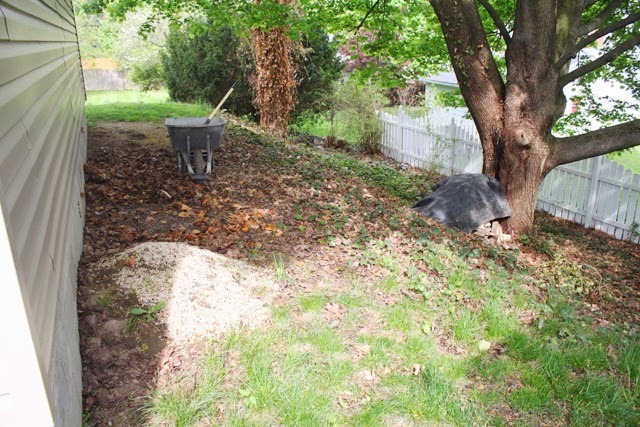 We're going to get the same stuff as our side neighbor used for the area between our driveways. It's been really nice the last couple of years, and it'll provide a better ground cover than our wishful grass. We've got to clean up after the termite exterminator, but thankfully we're finally officially into nice weather again so we're anxious to get the rock down to make an actual useful space behind the garage.